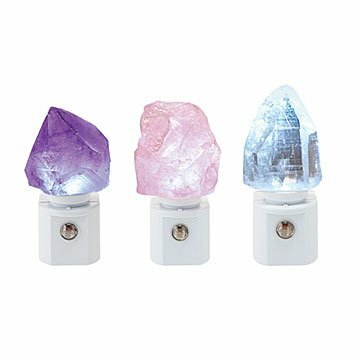 Powered by long-lasting LED bulbs, these gemstone nightlights sense when to turn on and back off. Glowing gemstones sound like something you'd only read about in a fairy tale, right? Thanks to maker Aldeane Josephs, you're in for a pleasant surprise: they're real! These ethereal nightlights are each made with the sparkling stone of your choice, whether that's amethyst, rose quartz, or white quartz, and powered by long-lasting LED bulbs. Equipped with a built-in sensor, they're programmed to light up automatically when a room gets dark, shutting off again as daylight returns. They tell us that's technology at work, but we gotta admit, we think it sounds a little like magic. Handmade in Maryland. Like many makers, Aldeane Josephs decided to start her own business after retiring from her corporate job. A longtime lover of interior design and home decor, Aldeane seized the opportunity to get in touch with her creative side and began crafting nightlights using natural crystals and semi-precious stones. Aldeane hand picks each stone for its unique beauty and ability to transmit light. In her eyes, they're "a great way to bring an unexpected dose of the exotic into the home." .5 watt LED long-lasting light bulb included. So gorgeous and unique--make great gifts!! I use these in the kitchen, bathroom, and hallway. They are beautiful in the daylight and turn on automatically in the dark to offer beautiful, glowing illumination. They are just right to help you navigate in the dark without stumbling. We all love the look of this beauty in our daughters room!! I loved the look of these nightlights as posted online, but quite honestly, I am very disappointed with the real product. They are TINY. The stones are not nice cuts of "gemstones"...they look awful and are dirty. It's almost like someone picked pieces of gemstone out of the leftover trash. So not worth the money. I am embarrassed I bought this for a gift. I bought two different colors and gave them for gifts, writing on the bottom of each box the coordinating meaning of the stones. I am totally delighted with this product and would buy it again for someone else. I want these in all colors! A really pretty decoration, that is also useful. I use this in my master bathroom for when I get up in the night. It isn't too bright, and it illuminates just enough to prevent a trip or fall. The crystal is very pretty. Even better looking and functioning than the catalog portrays; super bright light--I ordered the white one--is enough to light up a hallway or corner with a soft yet illuminating glow. I'll be ordering the other colors as well. What is great, daughter in law ask for it.